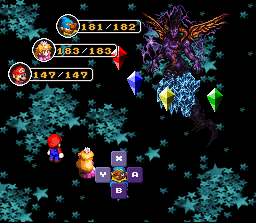 The Water Crystal is an enemy encountered in battle alongside the optional boss Culex in Super Mario RPG: Legend of the Seven Stars. Like Culex and the other crystals, it is from the dimension of Vanda and met in a portal leading to that world found in Monstro Town. The Water Crystal is the second weakest crystal. While wielding decent Defense, its Magic Attack and Magic Defense are still lower than that of the Fire Crystal. It uses mostly ice-based moves, namely Ice Rock, Blizzard, Crystal and Solidify, as well as the non-elemental Diamond Saw. Its only weakness are Fire-based attacks. Psychopath "Get me back underground!" All four of the Crystals originally appeared in Final Fantasy and featured prominently in Final Fantasy IV, from which Culex's theme music comes. Paper Mario, which was conceived as a sequel, has the Crystal Bits serving much the same purpose and appearance alongside the Crystal King. This page was last edited on July 8, 2018, at 14:06.